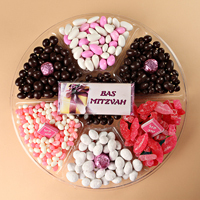 Celebrate the Bat Mitzvah with our beautiful and delicious arrangements! Mazel Tov! For the chocolate lover! 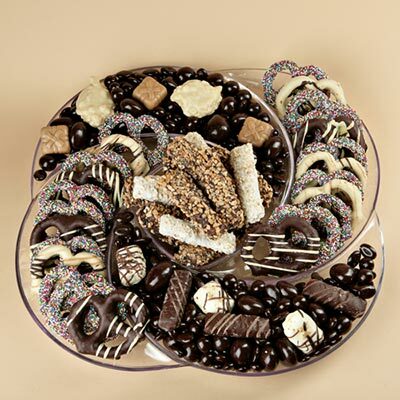 Our fabulous dark chocolate platter teeming with chocolate covered delicacies: Viennese Crunch, chocolate pretzels, chocolate wafers, truffles and chocolate patties make this a fabulous decadent platter! Sure to please! A delicious mix of dark chocolates and nut platter to celebrate.A selection of Viennese crunch, cashews and chocolates are included. Measures 9" x 12". Bat Mitzvah Pinwheel - free shipping! 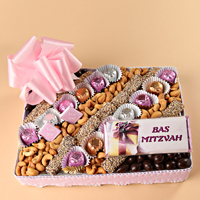 Pink and white chocolates, white powdered toffee almonds, jelly beans, jordan almonds topped with foiled and Mazel Tov chocolates makes this gift a popular favorite. An indulgent display of fancy chocolates, truffles, Viennese Crunch and nuts to celebrate!This will wow everyone and will beautifully adorn the table. 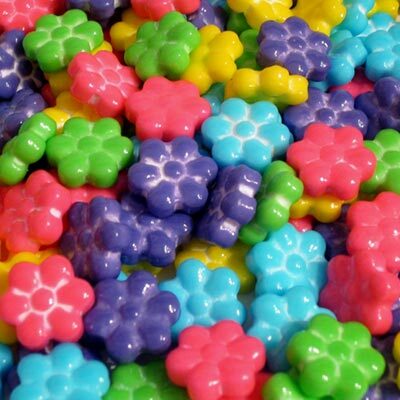 Sweet and colorful flower candy. Pretty and fun! Price is per pound. 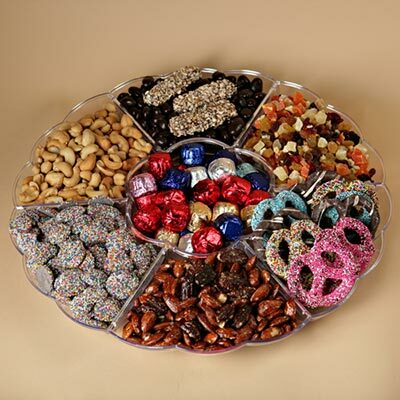 Spectacular Platter - Free Shipping! 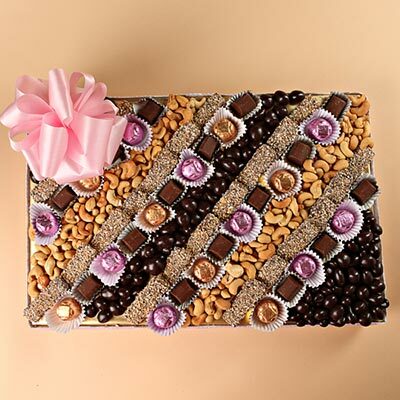 Large gift platter filled with delicious chocolate pretzels, sour bears, honey glazed almonds and pecans, Viennese Crunch,mixed chocolates, nonpareils, jelly beans and cranberry nut mix. 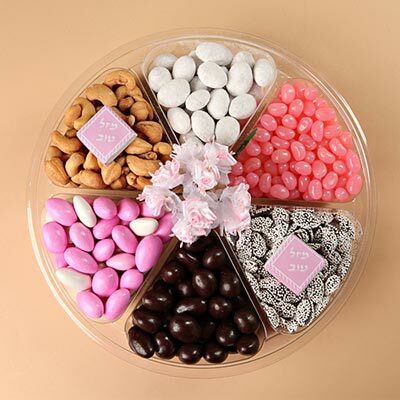 A platter with a variety of 6 choices to enjoy including white dusted almonds, dark chocolates including nonpareils cashews, pink jelly beans and jordan almonds. A nice selection! Celebrating a Bat Mitzvah, engagement, baby girl? 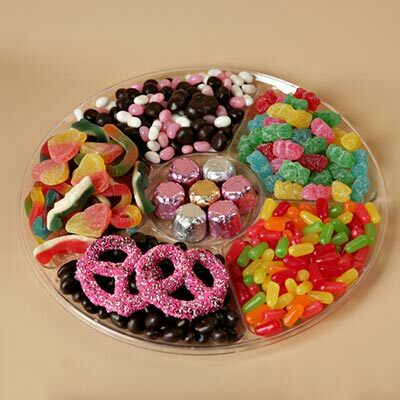 This is a sweet platter full of chocolates including truffles, jelly beans, Mike and Ikes and more. 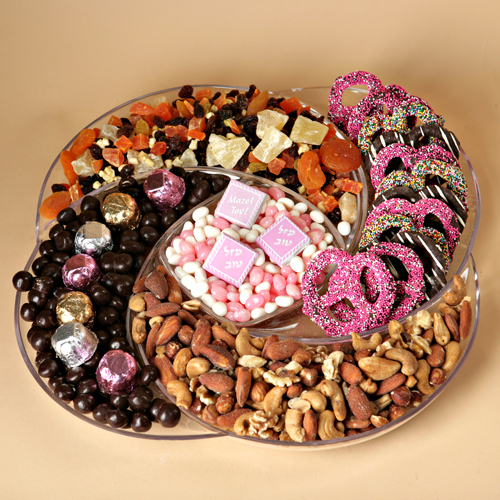 Perfect gift platter to celebrate that special occasion! 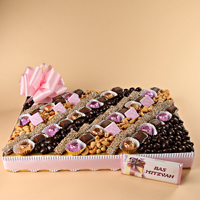 An indulgent display of fancy chocolates, truffles, Viennese Crunch and nuts to celebrate. This will wow everyone and will beautifully adorn the table.